Located in a beautiful setting for total relaxation in contemplation of uncontaminated waters of marine protected Plemmirio of Syracuse, the 80m2 villa is immersed in typical 2,200m2 mediterranean vegetation garden natural Reserve Park. 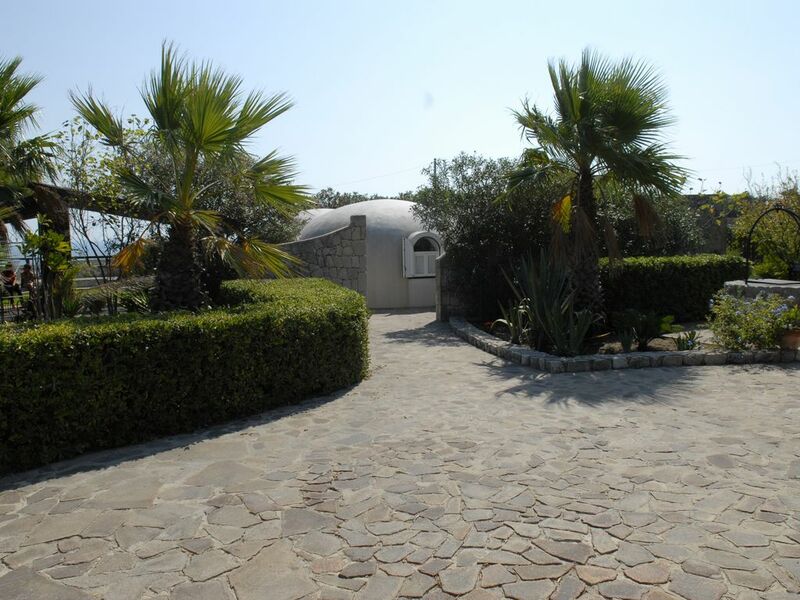 Tastefully furnished, the villa consists of: 1 double bedroom, 1 bedroom with two surposés beds, living room with sofa bed, reading area, kitchenette, bathroom with shower. The exterior has a second stone kitchen, living and well equipped overlooking a terrace with covered pavilion, with table and chairs, stone barbecue, oven, shower, laundry. A second covered veranda of 80 m2, with a beautiful wooden structure and equipped with tables, chairs, swing, lounge chairs, directly overlooking the sea, allows you to relax in peace and quiet with wonderful views. Free WIFI. A unique villa, reserved for those who love nature and the great outdoors. Click personal website: virtual tour. We had an amazing two weeks. The property was even more beautiful than in the pictures. Having our coffee on the terrazzo each morning with Siracusa across the bay and Etna looming behind was magnificent. Quiet walks along the sea through the nature reserve, watching and listening to the birds, and seeing the full moon rise over the water were just a few of the highlights. Angela was flexible and gracious, meeting us in town on a Sunday night after we were delayed by travel to lead us to the villa. She answered all of our questions and and was a kind and gracious host; the large basket of fruit she left for us was delicious. The accommodations were clean and well organized with a well-equipped kitchen. The gardens and terrazzo are the best part of the property, offering sun, shade, and a variety of views and places to relax. Siracusa is a short drive away, with lots of attractions there and in the nearby towns and cities, but it was hard to leave our home each day. We highly recommend this property. Nous avons passé 10 jours merveilleux... Mais malheureusement trop court! Le jardin magnifiquement entretenu avec vue sur la mer et Syracuse, la jolie maison originale, les différentes terrasses, tout était parfait! La maison dispose de toutes les commodités nécessaires, le tout dans une ambiance cosy. Idéal pour se reposer après les visites dans la région (Etna, Ragusa, Noto, Catane, Syracuse...). Mais que dire d'Angela et d'Attilio? Des hôtes adorables, apportant de bons conseils, et prêts à vous dépanner! C'était un séjour inoubliable, nous recommandons sans hésitation ! Sehr schöne Lage 10 km entfernt von Syrakus. Komplett eingerichtet mit allem was man braucht. Herrlicher Garten, sehr nette Vermieter, ruhig gelegen. Alles Tip-Top sauber. Angela est très disponible pour donner de bons conseils . We stayed here fot 2,5 weeks in july 2017. The house and garden are even better than in the pictures! Peaceful setting. Magnificent view. A lot of rivacy. Very friendly host(ess). Lots to see and do. We had a great time!